When Deborah Guthrie and Brandie Yates started the communications department in Meridian Township in 2012, they predicted that cable companies were going to switch their model from cable to satellite. This model would mean stations like theirs, HOMTV (Haslett, Okemos and Meridian television) were going to lose money. Now it looks like their prediction is coming true. The dark future they saw is coming true due to the legislation that has been passed and is on its way to being passed that will have a large effect on their funding. The FCC is working to push through rule changes that will affect the relationship between local access stations and cable companies. And in Michigan, a senate bill has already passed that will give even more power to big cable corporations. Every month on their cable bills, community members might wonder about the charge that’s simply listed as franchise or PEG (Public, Education and Government) fee. If they looked into it, they would find that these fees go straight to their local cable programs. This money allows these local stations to provide coverage of local meetings, city events and even high school sports. However, with new legislation on the way, these channels might not have the funding to provide content to the community. That’s why communities like Meridian Township have been sending letters to the Federal Communications Commission to fight the bill. “We do know over 140 communities across the state of Michigan wrote opposition emails, stating that they did not want it to pass. We know Sen. Carl Levin, he wrote a letter stating he didn’t want the cable preemption order passed,” said Guthrie, Meridian Township communications director. The only issue is that with the passing of the Senate bill and the rate that the FCC order is going it might be too late to stop it. These letters were sent to oppose the rule changes being proposed by the FCC that could devastate local access stations. The FCC released their second notice of proposed rule changes on Sept. 5. The current rule states that cable television providers must negotiate an agreement with Local Franchising Authorities (LFA). In these agreements, LFA’s state that in order for cable companies to provide cable to the area they must give back to the community, and that give back is a percentage of their annual gross revenue. “So the give back is in the way of franchise fees and PEG fees, and so they pay a percentage of their annual gross revenue to local franchise authorities and, Meridian Township the municipality is the LFA who oversees these cable contracts,” said Guthrie. These franchise fees and PEG fees are usually used to fund these local channels as HOMTV is 100 percent funded by the cable industry, said Guthrie. By definition, franchise fees can be used for anything, they can be put towards the police department or even fire. PEG fees on the other hand are solely used for these public, education and government channels and their video equipment, said Guthrie. 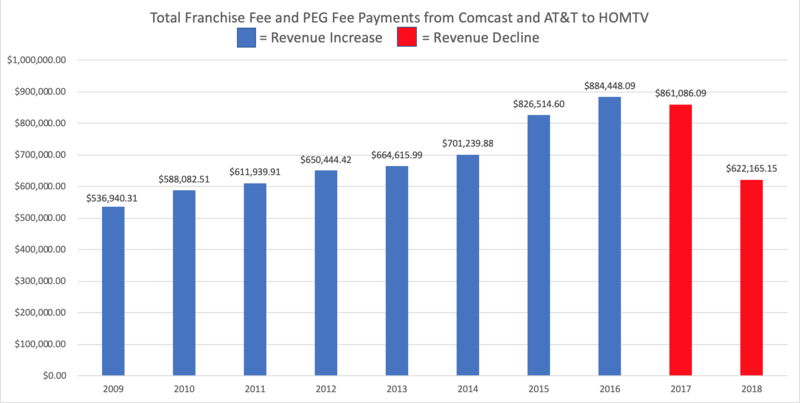 Under the current rules, all of the power is in the hands of the municipalities as they negotiate the exact percentage of franchise and PEG fees they receive from the cable companies. Meridian Township for example, receives 5 percent franchise fees from both AT&T and Comcast and 2 percent PEG fee from AT&T and 1 percent from Comcast, said Guthrie. However, with the proposed rule changes, the FCC would instead give the power to the cable companies. According to a letter from the U.S. Senate to FCC chairman Ajit Pai, it would allow cable operators to assign a value on these channels based on their in kind contributions which include things like free service to schools. They would then subtract that amount from the franchise fees that cable companies owe to the community. “It will definitely have a negative impact on the operation because if the FCC values a channel for instance at a million dollars, we don’t receive a million dollars in funding so therefore the city would be operating in the red and would actually have to pay back a cable provider for the use of the channel that we by right have under the cable act of 1992 which was really started in 1985,” said JoAnne Gurley, the cable regulation specialist at City Cable 15 in Southfield, Mich. City Cable 15 is a station, run very similar to HOMTV and one of the most prestigious local access channels with numerous awards for their programming. These proposed rule changes are not the only thing working against these PEG channels though. Michigan Senate Bill 637, or also known as the Small Wireless Communications Facilities Deployment Act, made it all the way to the Michigan House of Representatives and passed 74 to 35 on Nov. 28. This bill is all about 5G technology which, according to Verizon will allow for faster data collection, quicker downloads and a stronger network. According to crainsdetroit.com, this bill would allow wireless carriers to install poles for their new 5G technology for a fixed amount of $20 a year. The $20 price point is where the issue lies for Guthrie and other channels. “So, AT&T is going to pay $20 a pole for the year for 5G which is streaming services, Hulu, Netflix all that stuff is all 5G, autonomous vehicles all 5G, so you’re going to get all that for $20 a pole or you can have cable that everybody’s cutting at 7 percent of their annual gross revenue. So why would AT&T want to pay Meridian Township 7 percent of their annual gross revenue compared to $20 a pole,” said Guthrie. It’s clear that legislators haven’t thought about what they are doing to the community by passing this, they’re selling everyone out, as the community is the one who has to pay money to the cable companies, said Guthrie. With this potential new legislation cutting funding its easy to forget that these stations are already seeing a slowdown in funding. By virtue of receiving money from the cable industry, local channels are losing money as people cut the cord and move away from cable. “Our annual revenue from the industry is already shrinking, so we’ve already probably lost over 30 grand this year, I’d have to go look at the numbers and I think next year we’ll be 100 grand less than what we had this year,” said Guthrie. With this senate bill passing and the FCC changes looking more and more like they will be passed, HOMTV and other stations have had to find other sources of funding. HOMTV just earlier this year launched a sponsorship program. 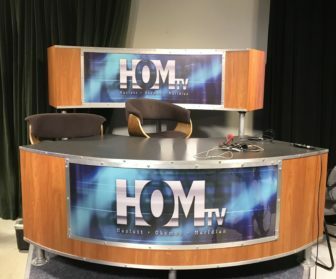 “We are launching, a soft launch if you will program sponsorship opportunities, so organizations, community members, businesses they can sponsor a HOMTV program to continue programming.” said Brandie Yates, who serves as the executive producer for HOMTV. 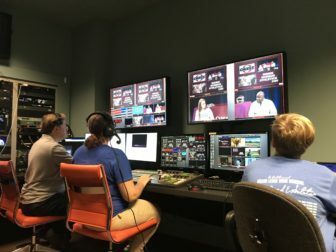 Along with the sponsorship program, HOMTV and the communication department are also reaching out to their alumni network which they have had since 1984, allowing ads to be run in their visitor guides, Guthrie said. With the FCC and cable industry on their back, local cable channels hope they find other forms of revenue and show people that PEG channels are important. “I think a lot of people actually do know about the PEG channels, it’s common knowledge that if a resident wants to find out what’s going on in their community whether its a council meeting, whether it’s what city events are coming up, what kind of local stories are taking place they know that they can always go to their PEG channels,” said Gurley. These channels are also more than just newscasts and live broadcasts of community meetings, most of Southfield Public Schools have channels where they broadcast all kinds of school events from sports to graduation, Gurley said. “So, the PEG channels are very important to the community because you get to see what’s taking place in your community,” said Gurley.